Unapologetically Female: Feminist Thoughts on Labyrinth! The key metaphor that I’m seeing is that Bowie’s Goblin King is the Patriarchy, with his pants and his shiny dream-balls and his minions and his illusions and his fortified castle and his fake-benevolence and his threats. At the climax, when directly confronted by the King, Sarah need only completely reject his power over her in order to be free. Perhaps this could be seen as a fault in the metaphor, a failure to interrogate to other systems forcibly holding women in their place. However, Sarah only gets to that point by enduring a series of hardships and difficulties, including misdirection, betrayal, poisoning, incarceration, and other physical and magical threats. When Sarah declares “you have no power over me!”, the metaphor is complete. She is talking about the dominance structures of society, about the entire edifice of patriarchy, and its weight of expectations and exploitation and false promises and threats. In this fantasy world, Sarah speaks truth to power, and liberates herself in the process. She declares the patriarchy a very real fiction, a shared fantasy, maintained by a multitude of people with a variety of investments and interests. Of course, in real life, things are not so easy as saying it makes it so – but Sarah didn’t actually have it that easy. The patriarchy is maintained by systems of dominance and duress, just as the castle beyond the Goblin City was almost impossible for Sarah to reach, and both her friends and her enemies attempted to slow her progress and turn her away from the final confrontation. Go read the whole thing, bask in the clips, take in Lauredhel's thoughts, and join the debate in the comments section. I'm impressed she can form not only coherent thoughts but deep, philosophical ones while looking at and thinking about David Bowie in that movie. I've seen it I-don't-know-how-many times, and they only thing I can tell you about it is OH MY GOD DAVID BOWIE IS SO FREAKIN' HOOOOOT. K: God, I know. I know some people think he looks ridiculous in the film, but I have never been able to watching it without drooling over him and his makeup and tights. L: Of course! It was a totally kickass post. And then she returns home to take care of a baby just like a woman should. Yeah, one of the commenters over at Hoyden made that point. That it could also be looked at as your typical "there's no place like home" story, which is actually not at all progressive for women and girls. 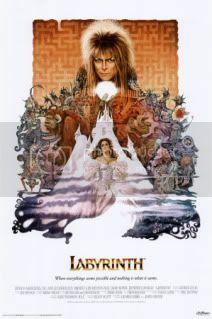 But either way, it's cool to think of Labyrinth as being deeper than a bunch of muppets and David Bowie in tights. "Less type, more sammich"? Lol wtf is wrong with you? No need to get so upset over the notion that women are people.